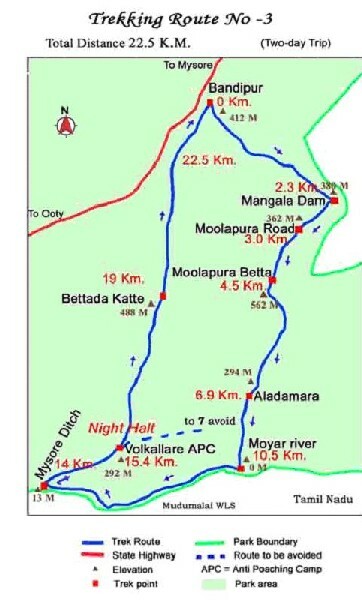 People who are interested in participating "Bandipur Trek" are requested to attend the meeting on 5th July 2005: 7:30PM. � To make payment of contribution amount. � To discuss the route and preferences. � To take suggestions, advices and comments on Bandipur Trek as well as other BMC activities. Landmark - Church Street, Opp. NASA Pub. With reference to people's interest, distance of journey, available days in hand & other pros and cons - Bandipur is the most suitable "Rain forest" to trek in July. BMC's last Bandipur trek was most exciting and memorable trek for all participants, and I am excited to announce same trek again. 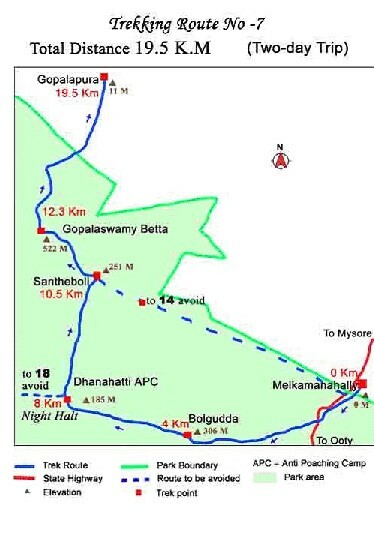 As per rules and regulations of Bandipur National Park - We can get permission for MAX 12 people per route. With reference to poll result, total head count could be more than 30; hence I am proposing 3 different routes with different difficulty levels. Dividing participants would be a difficult task here � We will discuss your interest and preference of difficulty level, but I request you to leave the final decision on us. Carrying tents and camping where day ends is strictly prohibited in Bandipur Forest area. 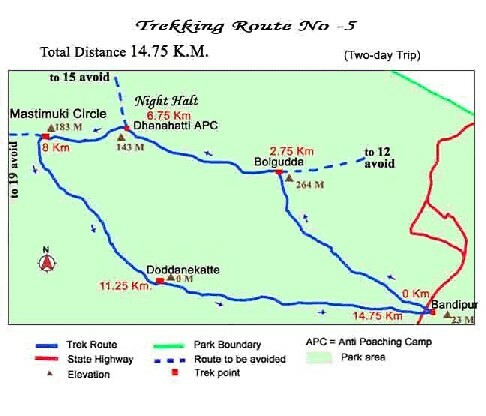 Groups should have to reach the Antipoching Camp (National park provided camping place) for night camping. Bandipur Forest is property of Karnataka govt. and protected as National Park/Reserve forest. They have very strict rules and regulations, and it's compulsory for every individual trekker to follow. The Bandipur National Park is a beautiful forest reserve located in the southern Indian state of Karnataka. It lies in the shadow of the Western Ghats on the Deccan plateau, and spreads across an area of about 875 sq km, 780-1455 m above sea level. The region is well endowed with vegetation and flora that ranges from dry and tropical deciduous and evergreen forests to open grassy woodlands. Valuable hardwoods, including rosewood and teak, are found here. The Moyar River runs through this national park and irrigates it, together with two other minor rivulets. The river also acts as a boundary between the park and the Madhumalai Sanctuary. Bandipur is one of the finest and most accessible habitats of the Asiatic elephant. Its vast open spaces make it a pleasant and convenient outing for visitors to see the elephant in its natural surroundings. To trek on the 3 routes with different difficulty level and distance in the forest to experience the nature, difficulties, camping and wildlife in Bandipur forest and enjoy the adventure. 10:30 PM � Depart from Bangaulore. Early morning - Start Trekking from Bandipur. Night - Reach �Symphony Theater � MG Road, Bangalore�. � Cotton shirts of dull color like forest-green or mud-brown. � Comfortable cotton trousers /pants /salwar khameez of earthy color. � Trekking shoes of good quality. � Hat / cap to ward off sunlight. Sweaters in winter. Wind cheater / rain coat during rains. Forest dept charges, Transport, Food (2- bfast, 2-lunch, 1- dinner), first aid kit, safety gears, Forest guide charges and miscellaneous. Lunch/Dinner/breakfast @ hotel, Door drop to your home. Above program details would be also available at https://bmcindia.org/events/bandipur-july05.html. Feel free to contact me for any further clarification.